The Copernican Revolution: Planetary Astronomy in the Development of Western Thought is a book written by Thomas S. Kuhn and published in 1957 by Harvard University Press. Thomas S. Kuhn is the author of the epoch-making Structure of Scientific Revolutions (1962), a book that pioneers a novel philosophical/sociological view on science and its practitioners. In it Kuhn introduces the concept of paradigm shift, a sudden change in outlook of members of a science community that occurs during a revolutionary change in their field. He describes scientists working during periods of non-revolutionary ("normal") science as solvers of a kind of puzzles that are not unlike jigsaw or crossword puzzles. The reader who expects to find in the Copernican Revolution some contours of Kuhn's renowned philosophy will be disappointed. The terms "paradigm" and "normal science" do not appear in it; the book is more a historical than a philosophical work. The Copernican Revolution, Kuhn’s ﬁrst book, is one of the best selling books ever written on the history of science. In 2003 the Harvard University Press edition was in its 24th printing, and this excludes the Vintage Book edition. It was one of Kuhn’s ﬁrst publications in the history of science; previously he had published six papers in this field, on seventeenth-century chemistry and on the Carnot cycle. The book had its origin in notes for a science course at Harvard based on a historical approach. The course was not so much about science itself, but more on an understanding of science aimed at students outside the sciences. This origin of the book is important to understanding the character of the book. By the "Copernican Revolution" Kuhn means the period in the history of science that is more commonly referred to as "the Scientific Revolution". The period is sharply defined: it begins with the publication of Copernicus' work De Revolutionibus Orbium Coelestium [About the revolutions of the heavenly spheres] in 1543 and closes with the appearance of Newton's Philosophiae Naturalis Principia Mathematica [The mathematical principles of natural philosophy] in 1687. The second half of Kuhn's Copernican Revolution covers the period of one-and-a-half century after Copernicus' death, while the first half of the book treats over two thousand years of development of pre-Copernican cosmology. The present Citizendium article summarizes the Copernican Revolution and in doing this it tells the story of one of the most fascinating chain of events in the history of science as seen through the eyes of Thomas Kuhn. As stated, Kuhn spends the first half of his book on the pre-Copernican view of mankind on the universe. His exposition starts with the Egyptians, goes from Antiquity through the Dark Ages and the later Middle Ages up to Copernicus. Kuhn describes Western Civilization's slowly awakening recognition of a cosmos that seemed to consist of the Sun, the Moon, the planets, the stars on a surrounding sphere, and, of course, the Earth at the center of it all. When Kuhn in chapter 5 discusses Copernicus' own work, it is remarkable that he refers to the latter's discovery: the Sun, not the Earth, is the geometric center of the Universe—as Copernicus' "innovation" not as his "revolution". One may argue that this underplays the importance of Copernicus' historic contribution to astronomy, but it is consistent, as Kuhn prefers to call the whole 145 year period starting in 1543 as the "Copernican revolution". Notwithstanding, the book treats Copernicus' innovation—the shift from a geocentric to a heliocentric universe—as a crucial and pivotal point in the development of cosmology and astronomy. According to Kuhn, the Copernican revolution was not only a revolution in astronomy but also entailed a revolution in science and philosophy and Kuhn relates how an astronomer's solution to an apparently technical problem fundamentally altered men's attitude to the basic problem's of everyday life. The Copernican Revolution, in Kuhn's meaning of the term, implies ﬁrst a reform in the fundamental concepts of astronomy, second a radical alteration in other sciences necessitated by the motion of the Earth, and third a still more comprehensive effect on philosophy, religion, and values resulting from no longer seeing the Earth as the unique center of God’s creation. The first chapter explains the primitive cosmologies of the Egyptians and Babylonians. It treats a good deal of astronomical theory, such as the apparent motion of the Sun as seen from Earth; it introduces concepts as ecliptic, winter/summer solstice and vernal/autumnal equinox. When the ancient Greek culture enters the stage, the oldest cosmological model—or rather a framework for a cosmology as the planets still must be placed inside it—the "Two-Sphere Universe" (a term coined by Kuhn), is introduced. It consists of a tiny spherical and stationary Earth at the geometric center of the large rotating (with 24 hour frequency) sphere of the stars (the Firmament). Kuhn argues that the idea that astronomy may supply a cosmological model is one of the most significant and characteristic novelties that we inherited from ancient Greek civilization. For the Greek and their successors the Sun and the Moon were two of the seven planets. Kuhn describes a rudimentary image of the universe that remained current in elementary books on astronomy and cosmology until the early 17th century, long after Copernicus' death. The Earth is at the center of the stellar sphere that bounds the universe. From the outside in are the orbits of Saturn, Jupiter, Mars, Sun, Venus, Mercury, and the Moon. Chapter 2 details how in a more refined model the retrograde motion of the planets is explained by epicycles, small circles that rotate uniformly about a point on the circumference of a second, uniformly rotating, circle, the deferent. This Hellenistic cosmology culminated in the Almagest of Ptolemy (ca 150 AD), a book that treats a complicated theory designed to predict the occurrences of the planets in the sky. 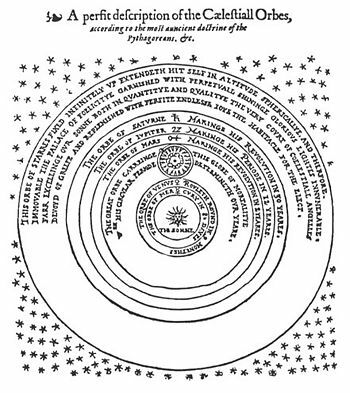 In Kuhn's words Ptolemy’s Almagest was "the ﬁrst systematic mathematical treatise to give a complete, detailed, and quantitative account of all the celestial motions." Generally, the planetary motions in the Almagest are composed of epicycles with centers on deferents, but Ptolemy also introduced equants. An equant is a point with respect to which the rotation of the deferent is uniform but the equant is shifted off the center of the deferent, so that the rotation of the deferent seen from its center is non-uniform. Copernicus' dislike of equants and the non-uniform motion introduced by them was one of his main motivations to search for a better planetary model. This chapter gives an account of Aristotelian cosmology and world view. According to Aristotle (384–322 BC) and his successors, the universe is finite and bounded by the sphere of the stars and its interior is mainly filled with aether. Aristotle believed that the very notion of vacuum is absurd, space and matter are inextricably bound together and therefore the universe must be filled with matter. The planets are moved by homocentric spherical shells consisting of aether. (Later the shell were thought to be thick enough to contain the deferent of the planet and its epicycles). The underside of the innermost shell—that of the moon—divides the universe into two totally disparate regions, filled with different sorts of matter and subject to different natural laws. The terrestrial, sublunar, region in which man lives is filled with the elements: fire, air, water, and earth. It is the region of variety, change, birth, death, generation and corruption. The motion of the lunar shell continuously pushes the four elements and therefore they can never be observed in their pure form. The celestial region, the moon and beyond, in contrast, is eternal and changeless; it consists solely of the pure, transparent, weightless, and incorruptible element aether. Chapter 4 describes the period between Ptolemy and Copernicus. At the beginning of this period, Western Europe lost most of the ancient knowledge with the fall (476) of the Western Roman Empire. The Islamic Chaliphates and, to a lesser extent, the Byzantine empire became the guardians and conservators of this knowledge. During the Dark Ages (that lasted until ca 1000 AD) even the fact that the earth is spherical was forgotten. At the beginning of the 4th century Lactantius ridiculed the concept of the spherical earth. In the middle of the 6th century, Kosmas, an Alexandrian monk, derived a Christian cosmology from the Bible. His universe was shaped like the tabernacle that the Lord instructed Moses to build. However, as stressed by Kuhn, these cosmologies never became official Church doctrine. In the 11th and 12th century some of the ancient knowledge was rediscovered, at first via the Córdoba Caliphate in Spain. During this period astronomical tables were imported from Toledo (the center of learning in the Córdoba Caliphate) and Ptolemy's Almagest and most of Aristotle's astronomical and physical writings were translated from Arabic into Latin. This was the time that the European awe for "ancient wisdom" and "The Philosopher" (Aristotle) was born. Initially, the Catholic Church considered the rediscovered antique science pagan, but scholastics as St. Thomas Aquinas (1225-1274) managed to reconcile the Aristotelian knowledge with Christian doctrine and its combination became the all embracing Christian world view. In this intellectual climate there wouldn't have been room for a Copernicus to posit a heliocentric model. However, as discussed in the second half of the chapter, later in the Middle Ages some criticisms against Aristotle's world view was voiced. In the Parisian nominalist school Nicole Oresme (d. 1382) tore some rents in the fabric of Aristotelian thought. But, whatever hypothetical objections these scholastic critics may have raised to Aristotelian cosmology, regarding the central position and immobility of the earth, the mobility and ﬁnite dimension of the stellar sphere, far more often than not they found very good reasons for refuting their own objections and concluding that Aristotle was right after all. Renaissance explorations and voyages (Columbus' first landfall in America was made when Copernicus was 19 years old) raised new questions and set the example for more innovations. Ancient astronomical computational techniques turned out to be fallible, as clearly brought to light by the cumulative errors of the Julian Calendar. It was found how wrong Ptolemy was as a geographer. Compared to the political uproar associated with the religious reforms of Luther and Calvin, an innovation in astronomy seemed a negligible event. All this gave more freedom of thought and prepared an intellectual climate that allowed Copernicus' innovation. Also more intellectual aspects of the Renaissance played a role. Humanism, the dominant learned movement of the age, was dogmatic anti-Aristotelian, and its criticism facilitated scientists to break away from Aristotle's roots. In addition, the Neoplatonic outlook of the Humanists, with its aesthetic taste for pure mathematics, created the atmosphere that instilled into Copernicus its dislike of the non-uniform motion of the planets that Ptolemy had introduced by using equants. Copernicus adhered as closely as he could to the classic Ptolemaic ideas. He still based his theory on a finite universe bounded by the sphere of the stars and also believed that the motion of the planets must be composed of perfect circles and that motions are uniform. He considered his elimination of equants (that induce non-uniform motions) as one of his most important contributions to mathematical astronomy. Because of its adherence to Ptolemy, Kuhn states that the De Revolutionibus is not a revolutionary but rather a revolution-making text. Copernicus' purpose was not to give the world a new cosmology, but to resolve the technical flaws he perceived in Ptolemaic astronomy. According to Kuhn, Copernicus' work consists of fairly narrow technical planetary astronomy, not of cosmology or philosophy. From Kepler's work (around 1610) it is known that the planetary orbits are elliptic rather than circular and hence it is not surprising that Copernicus' simple model based on circular orbits is only qualitatively correct. In order to obtain quantitative results Copernicus was forced to introduce epicycles, although fewer than Ptolemy had applied. Even so, Copernicus' predictions of planetary positions were as accurate as Ptolemy's, not better. Professional astronomers were the first to accept the heliocentric system. Some of them accepted it as a computational model and kept silent about its reality. For instance, Erasmus Reinhold (1511-1553) issued in 1551 a complete new set of astronomical tables (the Prutenic tables named for the Duke of Prussia) that were computed by Copernicus' methods. But Reinhold did not declare himself in favor of the Earth's motion. Georg Joachim Rheticus (1514-1576) published a defense of the system in 1540 even before the De Revolutionibus appeared. Michael Maestlin (1550-1631), too, agreed that the Earth was circling the Sun. However, religious leaders—as far as they were aware of it—opposed the new model, as they saw it in flagrant contradiction to Scripture. The Catholic Church only became fully aware of the Copernicus doctrine after Galileo Galilei started propagating it in Italy after 1610 and in 1616 it was placed on the Index (list of books forbidden by the Catholic Church). To the public at large it was self-evident that the earth was not moving, and for nearly a century after Copernicus it was very hard to convince anyone that the result of the Earth's motion would not be catastrophic. Tycho Brahe (1546-1601), the greatest naked-eye astronomer in history, did not follow Copernicus, but developed his own hybrid ("Tychonic") system that had the Earth at rest in the center of a rotating stellar sphere and the planets orbiting the Sun. The Sun and the Moon orbited the Earth, as in the Ptolemaic system. Brahe's younger colleague, Johannes Kepler (1571-1630), was educated as a Copernican by his teacher Maestlin and stayed this all his life. Kepler revised the system in a most fundamental way. He discarded all epicycles and let the Earth and other planets orbit the stationary Sun in elliptic orbits. His work the Rudolphine Tables (1627), derived from his new theory and based on Brahe's superb observations, was superior to all astronomical tables in use before. Kepler had, as Kuhn says, solved the problem of the planets. The most famous Copernican in history, no doubt, is Galileo Galilei (1564-1642). He was the first astronomer to make use of the telescope. His work, however, was mainly a mopping-up operation conducted after the victory of the heliocentric model was clearly in sight. Galileo observed on the surface of the Moon valleys and mountains and saw that the planet Jupiter has satellites. Both facts did not prove anything about the validity of the Copernican model, but were of great psychological impact as it showed that the heavens are not as majestic as they were always believed to be; they resemble the sublunar regions of the cosmos. Galilei also discovered Sun spots and saw that the Firmament carried many more stars than seen by the naked eye. A definite support for Copernicus' theory was given by Galileo's discovery of the phases of Venus. By telescope one can see that Venus is sometimes "new", as new Moon, and sometimes "full" as full Moon. This can only happen if Venus circles the Sun on an orbit that lies within the Earth's orbit, which was one of the predictions made by Copernicus and now convincingly proved by Galileo. Kuhn describes how in the second half of the 17th century all professional astronomers became adherents of the heliocentric model, notwithstanding the resistance of the Catholic church. It took the general public most of the 18th century to become converted to the new world-view. Although, as late as 1873 an ex-president of an American teachers' college published a work condemning Copernicus, Newton and many other distinguished astronomers for diverging from scriptural cosmology. Before the new world-view could be widely accepted, questions had to answered as: Why do heavy bodies fall toward the surface of the spinning Earth? How far away are the stars? What moves the planets now that Aristotelian spheres are no longer there to propel them? What keeps the planets in orbit? Many of these questions find answers in Isaac Newton's Principia (1687) that describes an infinite cosmos in which planets and stars attract each other with a strength proportional to their masses. Most histories of planetary astronomy therefore go from Kepler and Galileo directly to Newton. However, Kuhn makes a detour via atomism and the vortex theory of Descartes. From Thomas Digges: A Perfit Description of the Cælestiall Orbes (1576). Note the stars outside the stellar sphere and the Sun at the center. Kuhn begins chapter 7 with making plausible that, once the stellar sphere has lost its role as prime mover of the planetary spheres (the "heavens" of Aristotelian cosmology), the conceptual step to an unbounded infinite universe is not very large. Kuhn relates that as early as 1576 the English Copernican Thomas Digges introduced the idea of an infinite universe into an otherwise straightforward paraphrase of the De Revolutionibus. Remarking that Copernicanism and atomism seem at first sight totally unrelated doctrines, Kuhn proceeds by explaining that the atomists needed an infinite void for their corpuscles to move in. When one assumes that Copernicanism implies an infinite universe, the two doctrines are not as unrelated as they may seem. The most influential natural philosopher of the first half of the 17th century, Descartes, believed that all forces were transmitted by collisions with corpuscles. He gave the first clear statement of the law of inertial motion: a corpuscle in motion will continue to move at the same speed in a straight line unless it collides with another particle. Descartes believed that by collisions the corpuscles arrange themselves into vast circulations ("vortices"), and that these vortices carry the planets around the Sun. Descartes removed explicitly from natural philosophy the dichotomy between celestial and terrestrial laws that had been introduced by Aristotle two thousand years earlier. In 1666, much influenced by Descartes, Robert Hooke formulated a theory for the planetary motion that was based on inertia and the equivalence of celestial and terrestrial laws. A moving planet ought to travel uniformly in a straight line, he wrote, but since we know that its orbit circles the Sun, there must be an attractive force operating between the Sun and the planet. Although he thought that the strength of this force would fall off with increasing distance between Sun and planet he did not know how to generate a Kepler ellipse from it. That job was left for Newton. Newton proved around the same time that a point particle describes an ellipse when an immobile body attracts it with a force inversely proportional to distance. The heavy body is in one of the two foci of the ellipse. However, the Earth is not a point particle. In 1685 Newton proved that all the Earth's corpuscles can be treated as though they were located at the Earth's center. At last Kepler's laws were explained as the innate attraction between the fundamental corpuscles constituting the planets and the stars. Two years later Newton's Mathematical Principles of Natural Philosophy came out and the Copernican revolution was completed. ↑ Except that "paradigm" appears in the preface (p. ix) and on p. 222, at both places in its conventional meaning. ↑ Kuhn spells Coelestium as Caelestium, which is the more common Latin spelling. However, original frontispieces [reprinted in O. Gingerich, The Book Nobody Read: Chasing the Revolutions of Nicolaus Copernics, Penguin Books (2004)] give Cœlestium. ↑ Swerdlow loc. cit. disagrees that neoplatonic Humanism was pertinent to Copernicus' motivation. ↑ Kuhn relies with regard to the opinion of the 16th century protestant leaders, Luther, Melanchthon and Calvin on the work of A. D. White: A History of the Warfare of Science with Theology in Christendom, Appleton, New York, (1896). O. Gingerich (2004), loc. cit., has given reasons why White's work may not be completely reliable on this point. ↑ Kuhn does not mention that the book was admitted four years later but with a list of corrigenda added. The corrections all pertained to the reality, as opposed to the computational convenience, of the model. This page was last modified 23:47, 8 April 2014.